Unique and different. That's Marshmellos style.His Future Bass, Trap and Hip-Hop influenced sound is the perfect combination of genres that makes him stand out. There's a good reason why his sound become so popular in the last few years. It's absolutely catchy and chill yet still packs a ton of power. That's the reason we created this Soundbank. To make it easy for you to create such bangers yourself! If you listen closely to Marhsmello's tracks you'll notice his Drums are different! A lot of times he uses Hip-Hop Drums when it comes to Snares, Hi-Hats and other Cymbals. This gives his EDM tracks a whole new vibe. When it comes to Kicks you'll quickly notice that he uses short yet punchy Kicks in order to let the massive Bass in his drops do its thing. 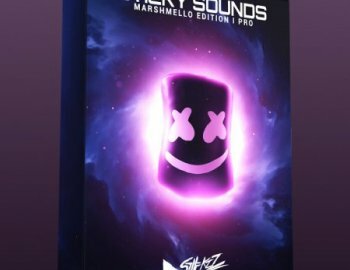 With this pack we made sure to create Drums which are all inspired by Marshmello to give you exactly those Drum sounds that simply work! Perfect tool to get started with the new genre. Study the Mix, Master, Layering, Sound-design & Arrangement. Remember those techniques and use them in your own products! Save your favorite Samples, Presets, Effect-chains & Effect-presets to use them in future projects of yours. Final tip: Reverse-engineer all six Project Files in their entirety. Take notes to remember all sorts of details and tricks! Having access to an artists Samples and Presets already gives you a huge advantage. However, having access to Project Files inspired by his songs is going to take reverse-engineering to a whole new level. We have crafted nine Project Files inspired by some of his biggest tracks to give you the opportunity to dive into the Project Files and learn how some of your favorite Marshmello tracks where created!